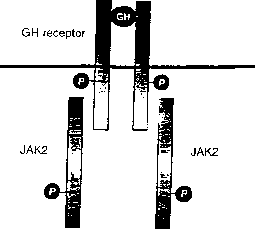 FIGURE 19-2 Structure of single-transmembrane-segment receptors that form homologous dimers; the growth hormone receptor. One GH molecule binds to identical binding sites on the extracellular domains of two GH receptors that form a homodimer. 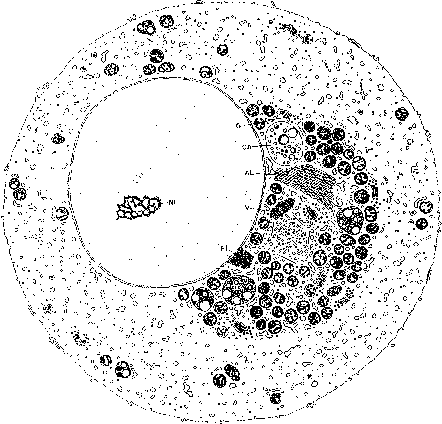 The intracellular domains associate with a tyrosine kinase of the Janus family of kinases. An encircled P denotes a potential tyrosine phosphorylation site on the intrecellular portion of GH receptor. Reproduced with permission from Gammeltoft, S. and Kahn, C. R. (1995). Hormone signaling via membrane receptors. In "Endocrinology" (L. J. De-Groot, ed. ), 3rd ed., Vol. 1, pp. 17-65. W.B. Saunders Co., Philadelphia, PA.
sequences of these hormones are shown in Figure 195. The signal transduction process of the EGF receptor can be formulated as shown in Figure 19-6. While EGF promotes mitosis in cells of mesodermal and ectodermal origin, TFG-a confers the transformed phenotype on normal cells. TGF-a has substantial homology to EGF and both growth factors operate through the EGF receptors. TGF-a may be the fetal ligand for EGF receptor. Amphiregulin stimulates the growth of normal fibroblasts and keratinocytes while it inhibits the growth of several breast carcinoma lines. It has a 43-amino-acid extension at its terminus compared to EGF, and this extension may contain a nuclear translocation signal. Heparin-binding EGF also has an N-terminal extension and acts through EGF-R. While the gene for cripto has been cloned, little is known about its signal transduction. The smallest form of active TGF-a contains 50 amino acids and is homologous to EGF. As shown in Figure 19-5, a presentation of six cysteine residues occurs in this family and provides the similar three-loop structures of EGF and TGF-a that explain the ability of both structures to bind to the EGF receptor. There is no evidence for a specific TGF-a receptor or for the activities of TGF-a on epithelial and mesenchymal cell proliferation; migration and differentiation appear to be due to the mediation of the TGF-a-EGFR interaction. The 50-amino acid form of TGF-a is released from a membrane precursor, as shown in Figure 19-7. Two forms of this 159- or 160-amino-acid pro-TGF-a are coexpressed due to the microheterogeneity of mRNA splicing. The cysteine-rich cytoplasmic domain is highly conserved. The 50-amino-acid TGF-a is released from the precursor by proteases that cleave AV bonds at both termini (black arrows). Sometimes the processing is incomplete and larger forms of TGF-a are released that are still biologically active. This type of processing to a mature hormone from a membrane precursor is common throughout the EGF family. EGF is matured in a similar fashion, although the membrane precursor is larger than pro-TGF-a. Presumably the release of mature soluble growth factor from the precursor membrane form is a regulated event.